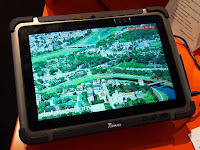 A rugged (or ruggedized, but also ruggedised) computer is a computer specifically designed to operate reliably in harsh usage environments and conditions, such as strong vibrations, extreme temperatures and wet or dusty conditions. They are designed from inception for the type of rough use typified by these conditions, not just in the external housing but in the internal components and cooling arrangements as well. In general, ruggedized and hardened computers share the same design robustness and frequently these terms are interchangeable. Typical environments for rugged laptops, tablet PCs and PDAs are public safety, field sales, field service, manufacturing, retail, healthcare, transportation/distribution and the military. They are used in the agricultural industries, and by individuals for outdoor recreation activities. Virtually all rugged computers share an underlying design philosophy of providing a controlled environment for the installed electronics. The electronic components themselves may be selected for their ability to withstand higher and lower operating temperatures than typical commercial components. They incorporate features such as fully sealed keyboards to protect against intrusion by dust or liquids, and scratch-resistant screens that are readable in direct sunlight. Rugged units have higher prices. However, one research study found that in environments where rugged computers are commonly used,total cost of ownership was 36 percent lower for rugged notebooks and 33 percent less for handhelds and PDAs, compared to conventional non-rugged versions. The lower overall cost is due to lower failure rates, the related impact on productivity, and other factors. A rugged laptop is built to operate reliably in dusty or wet environments and conditions. These laptops have a thicker and stronger housing compared to a regular laptop. These ruggedised laptops are mainly used for industrial, construction and military purposes. Yet a rugged laptop is able to comply with other important requirements such as high performance and governmental grade security. Rugged laptops are engineered to be mobile, they are vibration, shock, drop, dust and waterproof. Most rugged laptops are standard equipped with a strap for long-term use and comfortable travel holding. Even the modern-day rugged laptops are equipped with a serial port which is commonly used in the industrial and engineering related tasks. The levels of ruggardization are not standardized, but they are measured by various certifications such as MIL-STD-810 or ATEX. There are various brands that offer rugged laptops such as Dell, Panasonic, HP, Sony Vaio and Lenovo. 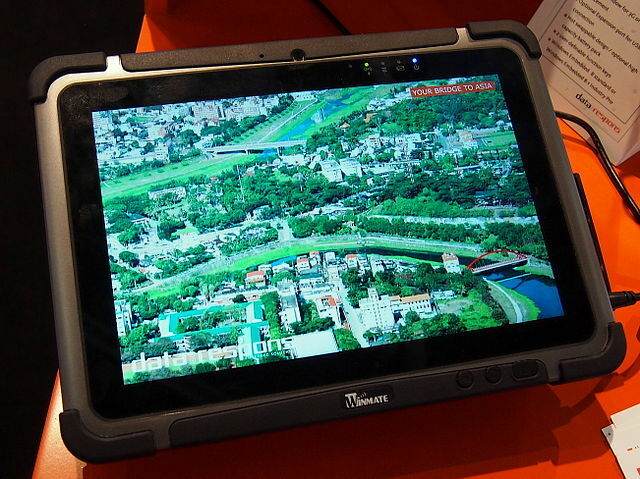 A rugged tablet computer may be semi-rugged or fully rugged. The semi-rugged might have a protective case, rain-resistant body. Fully rugged tablets are engineered from the inside-out to work in extreme temperatures and other harsh conditions. They are designed to resist drops, shocks and vibrations while maintaining strength to be dust- and waterproof. A tablet has internally a solid state hard drive and no moving parts. It doesn't need a fan as a laptop requires, improving its dust and waterproofness. Many rugged ones have options such as a barcode scanner because they serve in the logistics and transport sector. The levels of ruggardization of a tablet are not standardized within the telecommunications industry, but they are measured by various certifications such as IP, MIL-STD-810 or ATEX. A rugged smartphone has a thicker and completely sealed housing which protects it against all kinds of elements such as water, dust, shock and vibration. This kind of smartphone can be left out in a sandstorm, frozen in a blizzard or go underwater. A true fully rugged smartphone is substantially less susceptible to damage than a non-rugged smartphone. Like a rugged tablet, it typically meets IP certification and military standard specifications for dust, shock, vibration, rain, humidity, solar radiation, altitude and temperature extremes. Only a few manufactures make a rugged smartphone due to its complicated structure, different use of material and high level of quality expectation. Some rugged smartphones have Push-to-Talk (PTT) capabilities, NFC and barcode reader functions which suit their use for industrial and construction logistics. MIL-STD-810: Specifically MIL-STD-810G, a military standard, issued in 1962, which establishes a set of tests for determining equipment suitability to military operations. Often used as a reference in the commercial laptop industry. MIL-STD-461: A United States Military Standard that describes how to test equipment for electromagnetic compatibility. MIL-S-901: a military standard for shock which applies to equipment mounted on ships. Two levels apply. Grade A items are items which are essential to the safety and continued combat capability of the ship. Grade B items are items whose operation is not essential to the safety and combat capability of the ship but which could become a hazard to personnel, to Grade A items, or to the ship as a whole as a result of exposure to shock. Qualification testing is performed on a barge floating in a pond where TNT is detonated at various distances and depths in the pond to impart shock to the barges. IEEE 1613 Computers in electrical substations used to concentrate data or communicate with SCADA systems follow IEEE 1613 "Standard Environmental and Testing Requirements for Communications Networking Devices in Electric Power Substations." European standard EN 50155, "Railway Applications—Electronic Equipment Used On Rolling Stock", provides an example of a tough non-military specification. It extends operating temperature range (−25 – +70 °C), resistance to humidity, shocks, vibrations, radiation - encountered in vehicle or airborne installations. Wireless capability is a key requirement for most enterprise mobility applications, and it has been reported that wireless-transmission failure rates are three times higher for non-rugged notebooks compared to rugged units. This difference is attributed to the greater experience of rugged-notebook vendors at integrating multiple radios into their products. Each transmission failure leads to five to ten minutes in lost productivity as the user has to re-login to the company network through a VPN. Since enterprises are turning to cellular networks to enable full-time connectivity for their users, major vendors of rugged computers offer both built-in wireless LAN and wireless WAN capabilities, and partner with cellular carriers, such as Verizon and AT&T, as part of their offerings. During the handoff between the various wireless LAN and wireless WAN connections, a mobile VPN allows the connection to persist, creating an always-connected infrastructure that is simpler for the user and eliminates application crashes and data loss. Last updated on 9 June 2016 at 00:10. I notice you mentioned hardening devices and shock protection. Do you have any thought or links to guidelines about SGEMPs? I've read that a faraday cage wouldn't be a perfect protection, but the alternative of heavy metal shielding doesn't sound ideal either. I doubt this'll be a huge issue in most environments, but I'd be interested to know.